When faced with a fluffy puppy or doe-eyed dog, the common instinct for most is to bend over and take a closer look. However, most people aren't all people. There are a few who try to avoid being in the company of these canine friends as much as possible. Why? It’s because they have a condition called dog phobia, also known as cynophobia. As young as you are, your parents have taught you to be fearful of some things. This is to protect you from possible dangers because they do not want anything bad to happen to you. These are rules that parents impose in their household that ought to be followed by children. Some of these may be considered fair warnings, however, some parents tend to get a bit overboard and instead of protection, they inculcate irrational fear to children. For some, phobias may have developed out of one bad experience that was associated with the thing they fear the most such as dog. Luckily, you do not have to live with your dog phobia for life. Just like most medical conditions, there are ways by which you can overcome this. Here’s how you can win the battle against dog phobia. Why are you fearful of dogs to begin with? You have to dig deeper and try to understand why the very sight of a dog makes you want to crawl under the bed. Was it because you were bitten by one when you were younger? Was it because the neighbor’s dog chased you when you were coming home from school? Things such as these could make one generalize that all dogs are something to be scared about. However, a situation that looks very similar will not always yield the same results. The terror you may have felt for a particular dog at one point in your life is now causing you to be afraid of all dogs. Once you get to the bottom of your fear, you will be given an idea how to address your existing problem. The most common problem with a person suffering from phobia is that they tend to have an emotional memory of the bad thing that has happened instead of using the rational mind to evaluate the current situation. Pain, big, scary, panic and dangerous. These are just some of the words that they link to their particular fear. For dog phobia sufferers, it’s the fear of being bitten. They think of fangs draws out and the booming bark coming from a dog. Some of these are just sitting at the back of their minds as a perceived event. Instead of drawing conclusions for events that have not happened yet, why not try to see things as they are? When you are in front of a dog, why not try to set aside your emotions for a moment and see that it is not out to get you? A walking dog may be just what it is – a walking dog and nothing else. Fight your emotions and use your head instead. Thinking of overcoming dog phobia is a step that should come with goals. You cannot just simply think and expect to wake up one day and your fear is gone. Fighting it with your mind is one of the biggest obstacles that you can ever make. But backing these up with visible goals could chase the fear altogether away from your life. What are examples of these? If you are too afraid to even see pictures of dogs, the first thing you should be working on is trying to expose yourself to one. If you are too afraid to be with a live dog, then it would be a good idea to first getting used to looking at their pictures. Remember that you are trying to reverse the fear and instead of looking at fierce dogs, you may be better off looking at dogs that have smirks on their faces such that of a golden retriever. Your mind is a very powerful organ that whatever it thinks, your body tends to follow. To erase fear of dogs, you need to recondition your mind to think that dogs are truly man’s best friend. Only when you are exposed to real situations where dogs aren’t aggressive will you be able to think that you have nothing to be scared about. Once you get used to looking at pictures, it’s time to be in the world of dogs. Don’t get too excited and try to reverse the fear in just a moment. Consider this - will an infection go away after taking one antibiotic pill? Goals need not be overly big steps at first. For someone who has a fear of dogs, one milestone could be a trip to a pet store and just gazing over the puppies from a window. Then taking it a notch higher and holding a small pup from a leash. After that, it’s patting a docile dog on the head. A visit to a dog park on the weekends with someone you trust may be done once you've established a certain level of comfort with small dogs. Once you hit your goals, don’t just stay there. Beat your latest achievements and keep repeating the ones that you've already made. That way, these activities will gradually take away the negative feelings toward dogs. Exaggerated feelings of fear toward dogs will keep you from having one at home, much less from forming a relationship with them. This will not only cripple you but if you have kids at home, you might pass on your fear to your children. Living in fear of something so wonderful such as pet dogs could make you miss out on the best life has to offer. The ability to spend your time with the world’s best friend that a man could ever and a life that could care for you even more than your real blood. But dogs are very sensitive and will know right away of you don’t like them. You must first gain the courage to try and like them before they could learn to trust you and this can only be made possible if you learn to shake away the fear. Jordan Walker considers himself a true dog fanatic and owns several of these. He shares his experiences as a pet-owner in Coops And Cages and in other blogs where he interacts with other pet lovers, sharing his thoughts on popular pet issues. This article is intended for people who are fearful of dogs, hoping that they will be able to overcome their situation with these useful tips. Join in and write your own page! It's easy to do. How? 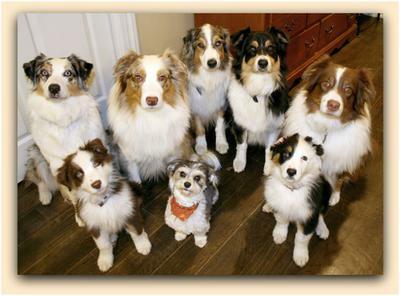 Simply click here to return to Dog Articles & Guest Posts. Great deals on vitamins for you and your pet! Be sure to visit our Zazzle store. 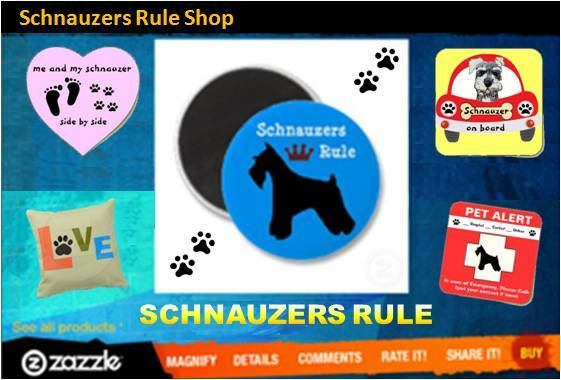 We have lots gifts for Miniature Schnauzer Lovers including T Shirts, Stickers, Home Decor items and more. Got Schnauzer? Copyrighted material may not be re-published without written permission.